I got it, but now it doesn't show matrimelee game. Matrimelee game worked before, but now it is not detected by frontend. How do I make work? Game list, please (in text file). This emu doesn't work it keeps on going into media player in other words you can't download it the link is faulty. 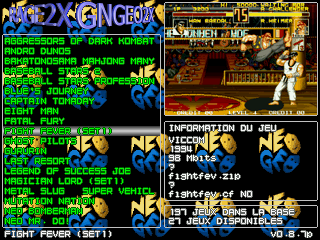 Works fine for me, but this isn't an emulator, just a Frontend for GNGeo. Very nice and clean frontend. Thanks!